CNG: eAuction 427. MACEDON, Chalkidian League. 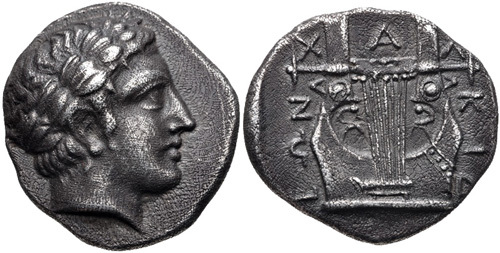 Circa 383/2 BC. AR Tetradrachm (23.5mm, 14.00 g, 3h). Olynthos mint. 427, Lot: 5. Estimate $1000. MACEDON, Chalkidian League. Circa 383/2 BC. AR Tetradrachm (23.5mm, 14.00 g, 3h). Olynthos mint. Head of Apollo right, wearing laurel wreath / Kithara within incuse square. Robinson & Clement Group H, – (unlisted dies); HGC 3, 498; CNG 108, lot 48 (same dies). VF, toned, granular surfaces. Ex Elsen 105 (12 June 2010), lot 57.